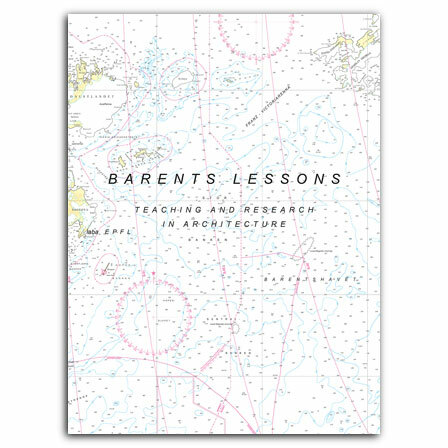 Barents Lessons gives an insight into an architectural research project at Laboratory Basel (laba), a satellite studio affiliated to the Ecole Polytechnique Fédéral de Lausanne (EPFL) in Basel, Switzerland. The project focused on the remote and geographically extreme, yet resource-rich and therefore geo-strategically crucial Barents Sea region. Starting with the thesis that the ocean is an urbanised territory, the participants carried-out a one-year investigation, moving from the territorial to the architectural scale over two terms. The task was to analyse the region from a distance, aligning the critical issues in the Barents Sea with a global picture, and to carry out in-depth local field-work. As a synthesis of the knowledge and experience gained, concrete architectural projects for various purposes (residential, science and technology, industrial, transport, leisure etc.) were designed. Barents Lessons presents the entire project in three parts, reflecting the methodology applied. The book is illustrated throughout with numerous graphics and maps especially developed for the publication, with colour photographs and plans. Named one of Most Beautiful Swiss Books 2012. Named one of the Most Beautiful German Books 2013. Design by Ludovic Balland Typography Cabinet. is an architect and has been a research assistant at laba since 2010.